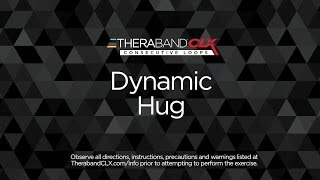 Fortunately, stretching and strengthening the shoulder muscles using foam rollers, exercise balls, and resistance bands like the TheraBand CLX can put swimmers back in the fast lane. One eight-week training program improved swimmers’ form, rebalanced their neck and shoulder muscles, and helped their joints work more efficiently. Another 12-week plan with just four moves strengthened shoulders in a way likely leading to fewer injuries and better performances. Shore up your shoulders with moves like the dynamic hug shown below. A few exercises three times a week could be all you need to splash safely. Placing the CLX around your upper back, grip each end of the CLX through the end Easy Grip Loops. Abduct your shoulders about 60° and bend your elbows about 45°. Keeping your arms raised and in position, push your arms forward and inward as if you were giving someone a hug. When your hands meet in the middle, hold briefly and then slowly return to the starting position. Avoid shrugging shoulders to perform exercise.